Inspired by my neighbor Larry solar installation and the continue drop in price for solar panels, we decided to put some on our house. The only available roof space was on a West facing roof. While it will only generate about 80% of the power of a South facing roof, since the price was low it still makes economically sense. I was also interested in using Michigan made solar panels. Contractor’s Builders Supply located in the Traverse City area are now making (assembling) solar panels. We’re using the SS-250, 60 cell, panels. As the home owner, I was able to pull the building and electrical permits myself. My neighbors Charlie, Dave, Mark, and Bobby came over and helped with the project. I was surprised that we could get it all done in two weekends. Just for fun, we did the installation using only hand tools. We have passed our inspections and generating power. You can see lots of pictures here, and track our energy production here. All the bills are in and here is the breakdown of the costs. Those are the actual costs, but I had several left over parts. For example I needed 9 rails but they only came in bundles of 10. Same with the roof mounts, I needed 24 but had to buy 32. Here are our adjusted or true costs. It’s interesting to note that the inverters cost more than the solar panels. Micro-inverters are nice and seem inexpensive, but if you add in the special cables, mounting hardware, and communication gateway for monitoring the power, it get’s quite expensive. We are lucky to get the project finished so quickly, so we can claim the renewable energy tax credit on our taxes in April. That will knock off 30% of the price. So the real out-of-pocket cost is (2.416*0.70) $1.691/watt, or (1.691*4500) $7610 for our 4.5 kW system. Using a fixed price for power of $0.18/kWh, the system should generate about $850 dollar worth of power per year. That means it will take about 9 year to payoff. If the price of power rises, the payback period will be shorter. If the panels were facing South the system would generation about 20% more power and pay off even quicker, maybe in 6 years. 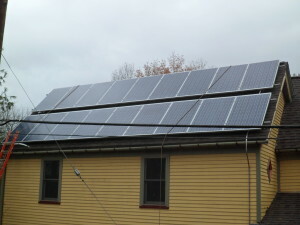 The panels and inverters are warranty for 25 years but should last 30 or more years. Come join us at the ribbon cutting for the third solar installation at the Ypsilanti Food Cooperative. You can view the FaceBook invitation here. 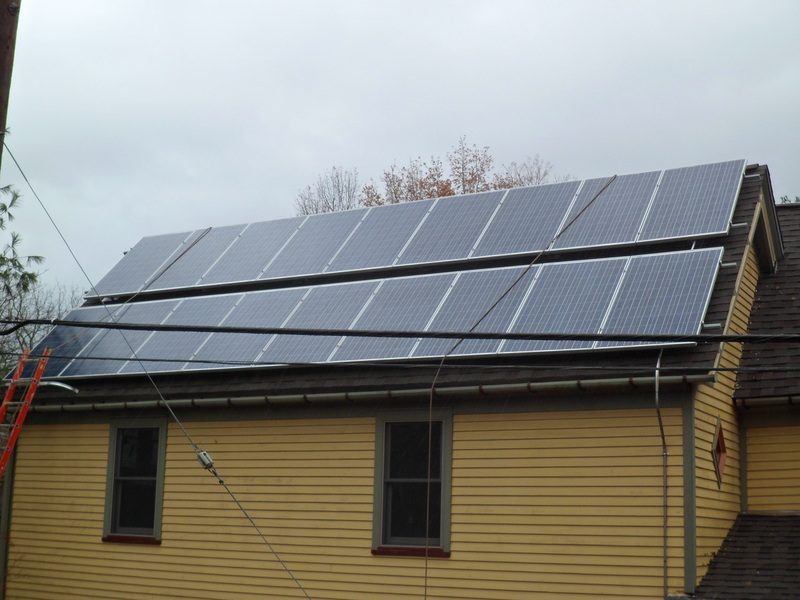 The system is using Evergreen panels and Enphase micro inverters. We were able to get the installation cost under $3/watt. Here is a break down of the costs. Many thanks to Chuck Hookham who reviewed the structural design of the rack for the solar panels and the many volunteers that helped haul, lift, rack, wire, and supported this project. Here is a video of Josie explaining how the new solar installation. Hope to see you at the ribbon cutting. Kevin Krzyzanski the owner of 403 S. Huron sent me this note the other day about the solar performance at his rental. Overall, I am thrilled with the performance of my system. The roof panels outperformed the carport panels by 37% for two obvious reasons — tilt and shading. However, having the microinverters in the back definitely minimized the impact of the shading and has proven to be a good choice in that regard. Overall, the system generated around 12,900kWh in its first full year of operation. That equates to a little over 35kWh per day. It also means that, even with the shading issues, I received around 65% of the power (in AC) that the array was capable of (in DC). The numbers are skewed, however, due to the size of the carport array. The rooftop panels actually converted 92% of their expected DC power into AC power, which was very much in line with what the installers had told me the microinverters were capable of. The overall energy was lower than anticipated (again, due to the slightly lower output of the carport array versus the anticipated totals) but after a full year of actual numbers, my payback has only adjusted from 5-6 years to 7-8 years, still a very quick ROI. One thing of note for your personal knowledge bank — my 55 panel array was only completely up for a total of 60-80 days. The rest of the time, *at least* one microinverter was down. EnPhase was quick to send out replacements and my installer was quick to do the swap. But I had 6 of the 55 inverters fail at one point or another. I’m hopeful that Enphase gets the bugs out in the next few years while I’m still under warranty but it’s definitely something that I felt you should know about. Reliability with the Enphase microinverters could be an issue. Hopefully with the failing EnPhase microinverters out of the system, he’ll be making more power next year.